Leon is a fast food chain with a difference. Firstly, the food is quite good, and secondly, it’s prepared on the basis that it should taste good and do you good at the same time. , the restaurant’s third cookbook, stretches that last point to the maximum. There are recipes in here that contain suet. Nothing with suet in it can ever do you good, in a physical sense at least, but it’s guaranteed to taste good, so full marks on the first point. This cookbook fits into a neat category. It’s one of those books that get picked up a little skeptically, then put down on one side for a week or two. I was put off by the, well, by the whole sense of twee over-enthusiasm and homeliness of it, all quirkiness and bright colours. In Yorkshire, in January, we don’t do bright colours. Eventually, I came back to it and realised the error of my ways, for within the brightly coloured pages, with their photos of perfect people making and eating perfect food, there’s a tonne of great recipes. This shouldn’t have come as such a surprise. 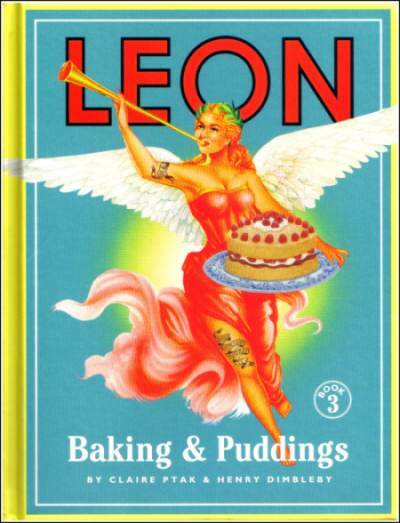 Really, Leon was made to produce a book about baking, and in retrospect, their take on puddings and baking in general was always likely to be good. The book starts with a good forty-five page chunk about practicalities like ingredients, equipment, techniques and what to do when it all goes to pot – the couple of pages of ‘first-aid’ tips for kitchen disasters could prove useful one of these days. The rest of the book is split into two halves – everyday recipes and ‘celebration’ recipes, which covers a range of occasions from Bonfire Night, through to Christmas, with a Turkish delight thrown in in honour of Eid. There’s a good range of food here, and it’s easy to pick out a few ‘yep, I’m going to cook that’ recipes just by flicking quickly through the pages. Pecan pie, a fruit cake with more fruit than cake and rather good looking tarte tartin leapt out straight away, but I won’t, however, be cooking a sweet potato pie topped with marshmallows – not in a million years. I might have a crack at that champagne granita, though, if I ever find myself in the unlikey but luxurious position of having half a bottle of champagne to spare. is essentially more of the same, but that’s no bad thing. The other two books were fantastic, and this is no exception. Everytime I see you’ve written up a book review I get both excited and a little resigned because I know, chances are, your review is going to make me want to go and get a book about a subject I, at the time, have only a fleeting interest in and then get obsessed by it. I was no great curry-lover but I read your review of Madhur Jaffrey’s Ultimate Curry Bible, bought it and loved in so much I not only installed a “curry day” once a week but then went on to buy it for my mother-in-law as well. You entranced me into getter Trish Hilferty and Tom Norringtons “Game”. “Odd Bits” by Jennifer McLagan, The Ginger Pig Meat Book and Claudia Rodan’s Book of Jewish Food also grace my shelves so I am being tenative as I read this because even though I have always stated “I don’t do cakes”, I sense that I will be doing cakes quite soon now.